While the last couple of days have been full of packing and endless errands, I did manage to squeeze in some work time. 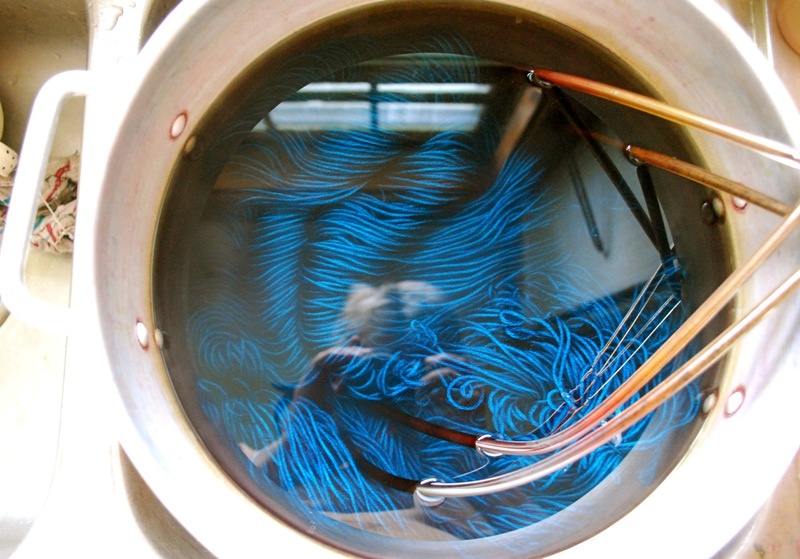 The Dirty Water DyeWorks website has been updated to include Edna. 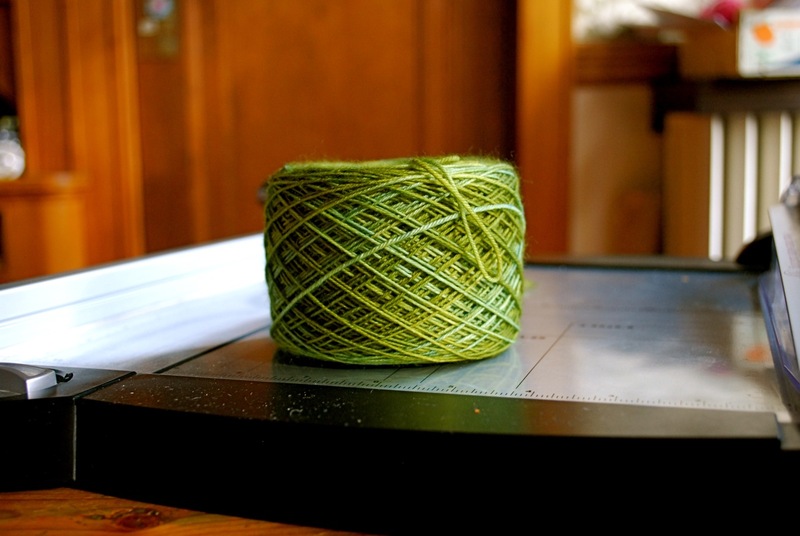 This DK weight yarn is a blend of 85% Polwarth Wool and 15% Silk. 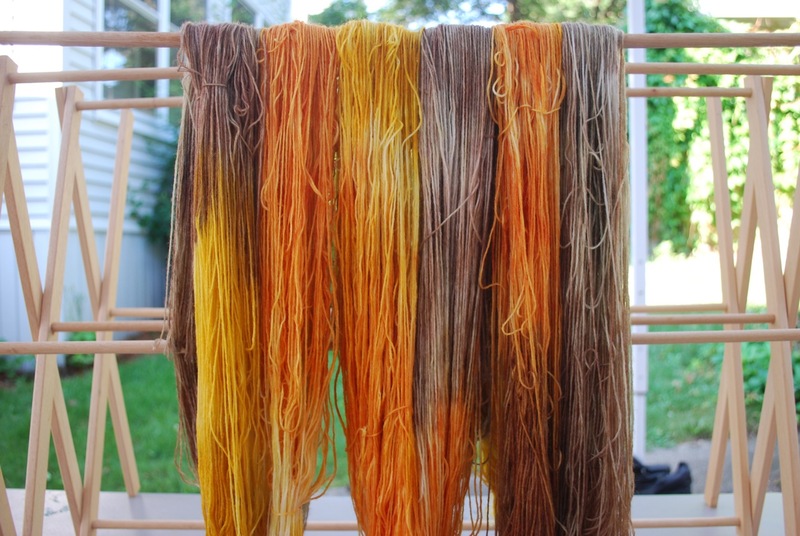 This base takes dye beautifully and produces colorways that have a subtle, silky shimmer. Edna has great stitch definition and is a dream to work with. I used Edna for the Cedar Leaf Shawlette and loved working with it. I'm already plotting a new project for Edna. If there's time, I'll blog during Sock Summit. I will be on Twitter, and you can follow my updates here. And now I must finish getting ready for my trip. 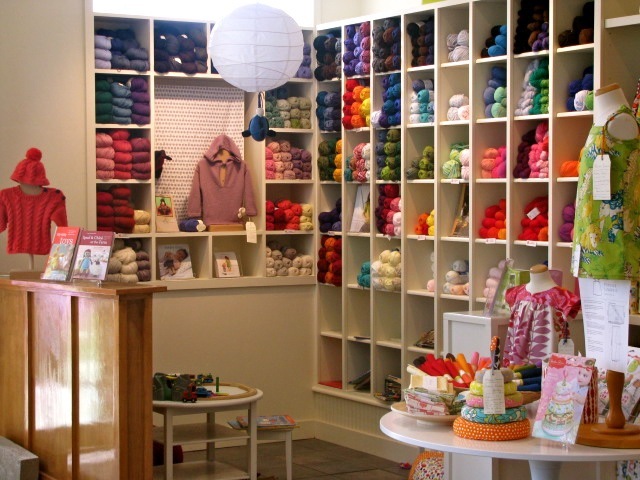 I still have to decide what knitting to take. Why did I leave the most important thing for the last minute? 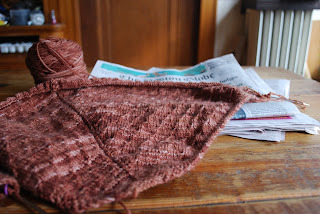 I was obsessed with my Cedar Leaf Shawlette at the end of last week, and that fascination continued through the weekend. 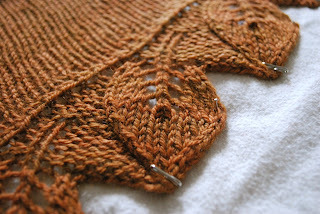 Cedar Leaf is off the needles. It's blocked and ready to travel. I'm delighted with this shawl. 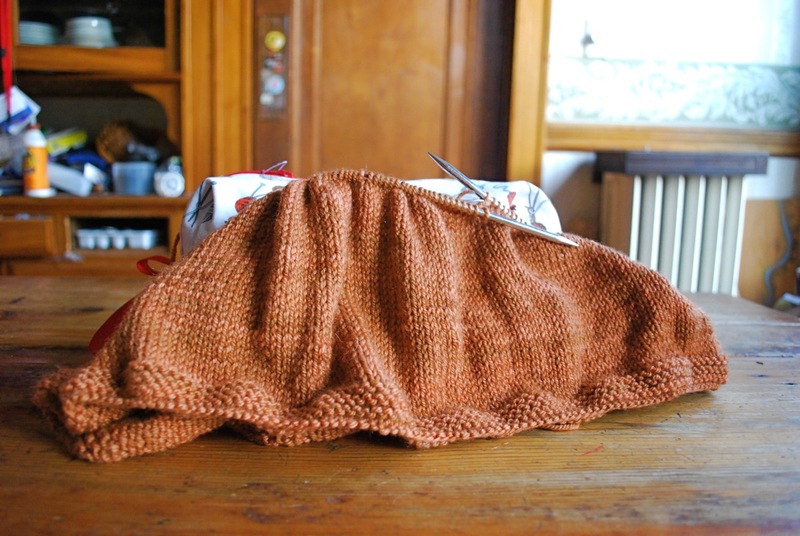 The design uses short rows to create a crescent shape. 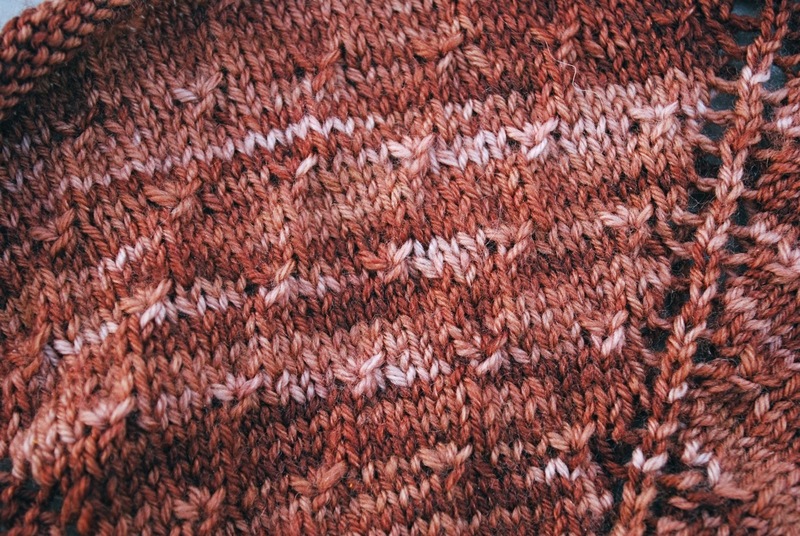 The border of leaves is knit and attached to the live body stitches. 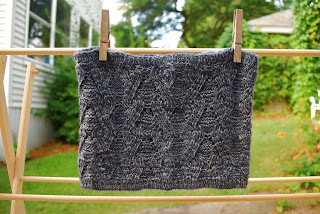 This shawl has wonderful drape and elegance. 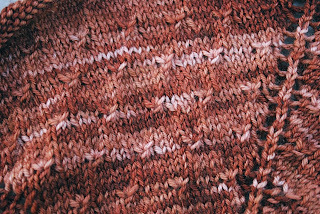 The yarn is Dirty Water DyeWorks Edna, colorway Acorn. 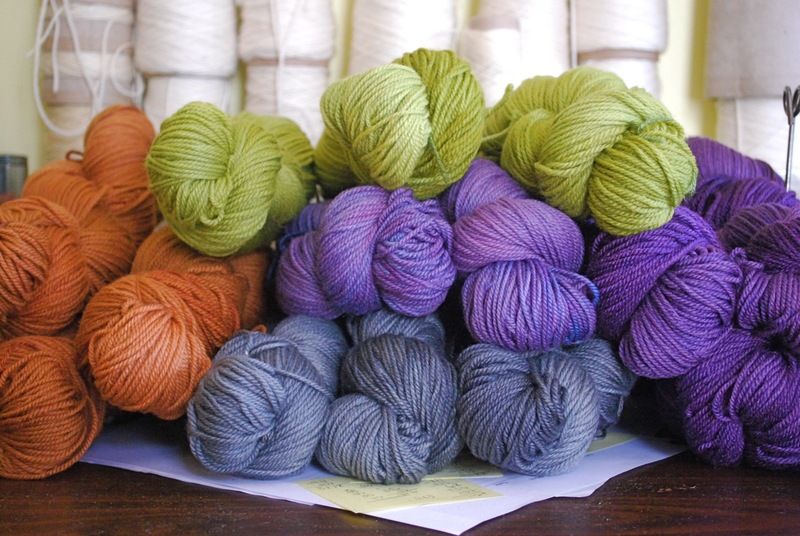 Edna is a new yarn line - a DK weight blend of 85% Polwarth Wool, 15% Silk. It will be up on the website soon. 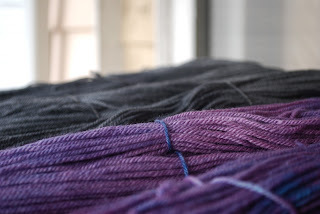 In anticipation of Sock Summit I want to start a new sock project. I've been looking at patterns. 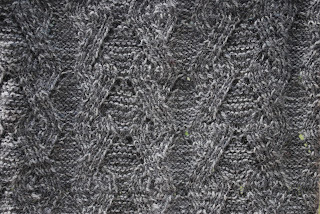 I don't want a mindless pattern, but I also don't want one that's going to require my undivided attention. So far no decision has been made on the pattern. But I have decided on the yarn. We are in the midst of a heat wave, and it has zapped all my energy. To say I'm feeling sluggish is putting it mildly. 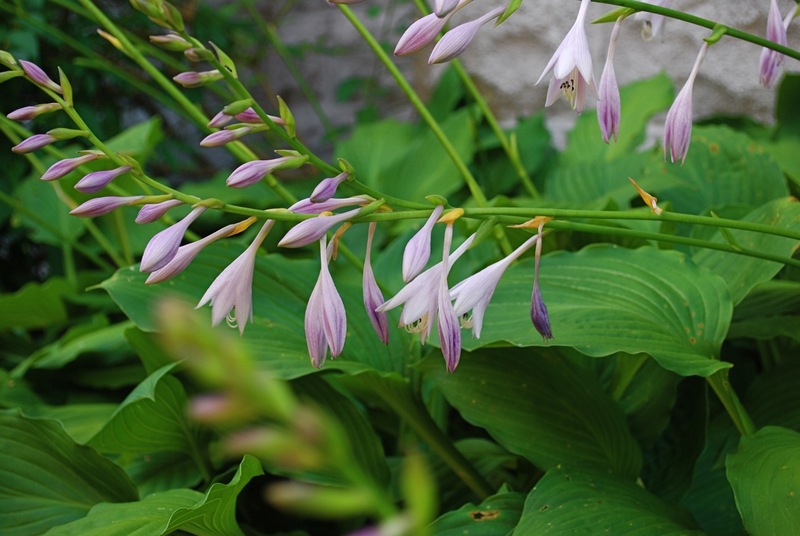 In this heat it takes three times as much energy to accomplish a fraction of what I normally do. I feel like crawling into a cave with instructions to wake me in the fall. The kids are doing their best to keep cool. Board games have replaced bike rides. 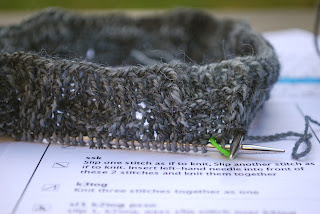 My coping strategy includes a new knitting project. 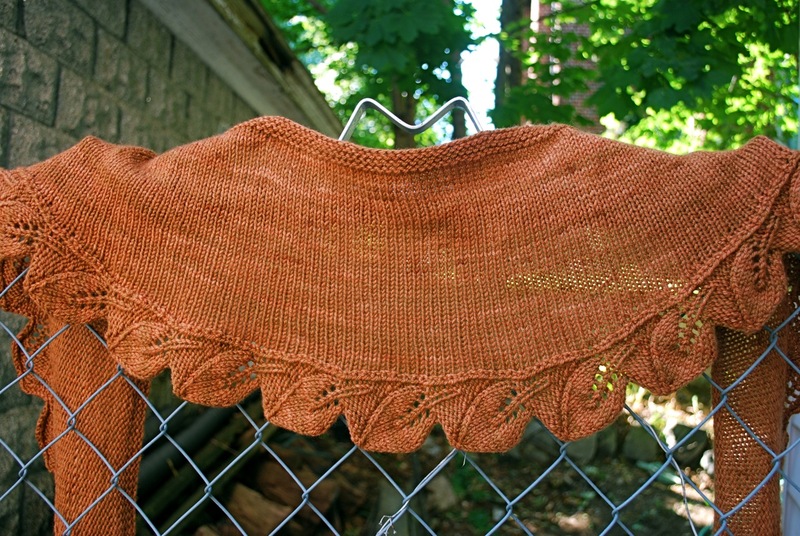 Cedar Leaf Shawlette. I'm mesmerized by the short rows - a temporary distraction from the heat. I did brave the heat for my weekly visit to the farmers' market. Lately I've been drawn to all things yellow. 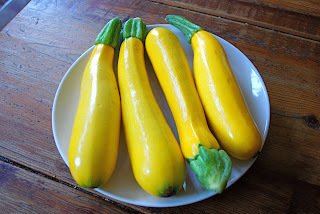 This week the farmers' market provided my yellow fix and my color inspiration. 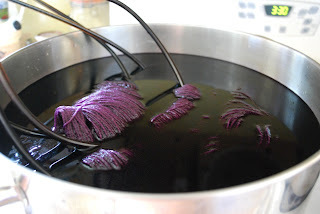 Dyeing yarn is fun on many different levels. 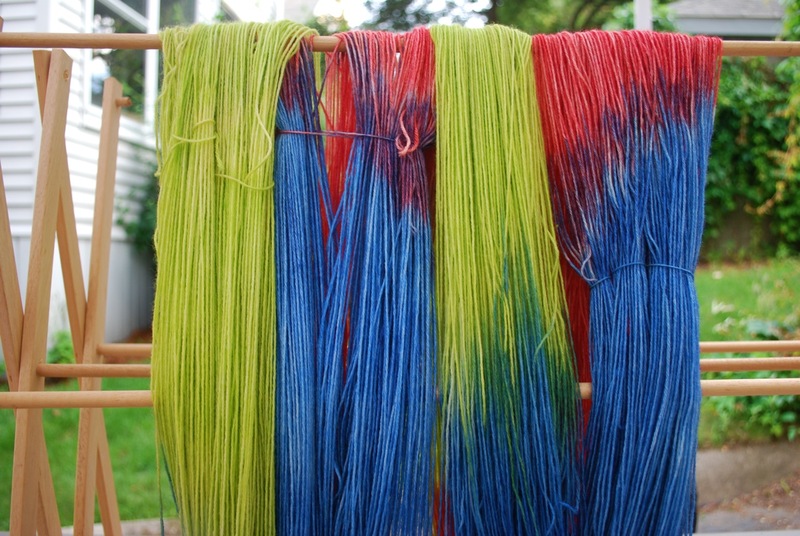 From choosing fiber blend and yarn weight to actually mixing colors - the possibilities are endless. And there's more fun once the finished product is in hand. What should I name this color? We play a little game around here called Name That Color. 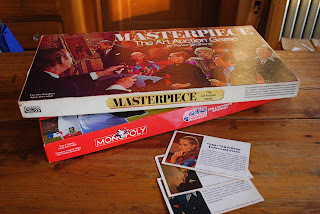 It's a great way to spend an evening at home with the family, and it doesn't take as long as a game of Monopoly. After I've been on a dyeing spree, I'll call for a round of Name That Color. We'll sit down with the nameless colorways and start tossing out suggestions. Colors may get several suggestions or only one. Then we work to fine-tune the suggestions. At this point we'll use the computer. The dictionary, thesaurus and Google Images are all helpful. What does the color camel really look like? What's another word for charcoal? We'll either decide that the first suggestion was, in fact, spot on or that we need a new suggestion. We go through this process with each color until they all have names. There isn't a formal vote, and I don't hold out for unanimous approval of each color name. Consensus is the goal. Since there isn't any scoring in this game, everyone's a winner. 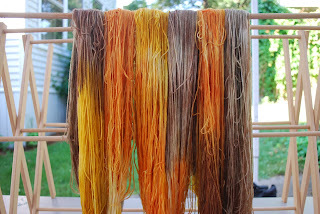 I've been busy with the dye pots. I put my multi-tasking efforts into high gear the last couple days, and I'm happy to report that I finished one of my projects. This is Curling by Anne Hanson. 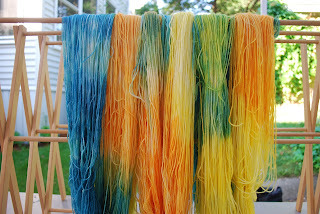 The yarn is Dirty Water DyeWorks Alpaca Blend - 60% Superwash Merino, 25% Alpaca, 15% Nylon. 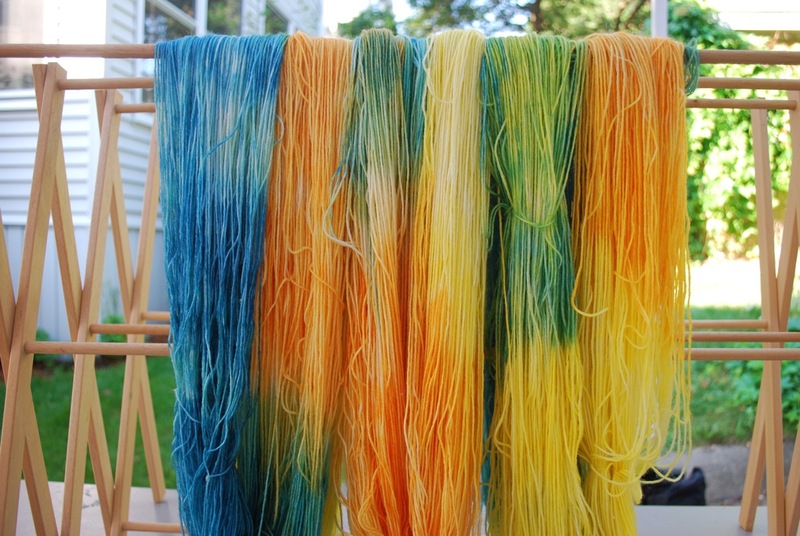 This yarn is currently available only at events. 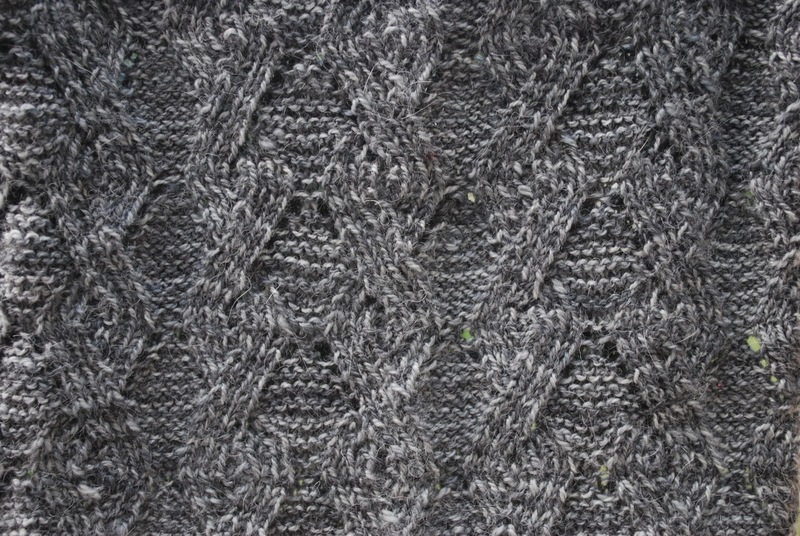 The design consists of a 16-row repeat. Curling uses a series of increases and decreases to create a cable-like effect. 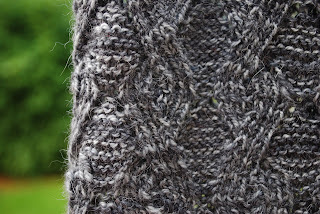 The fabric has wonderful depth and texture. I found this pattern to be both mesmerizing and highly addictive. Another item crossed off my to-do list. Since my booth shipped earlier this week, I've had the urge to start a new project. Actually several new projects. I have a very long list to choose from, and so many of them are tempting. 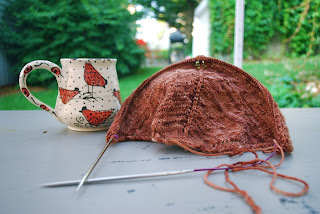 I was proud of myself for showing restraint and casting on only one new project. 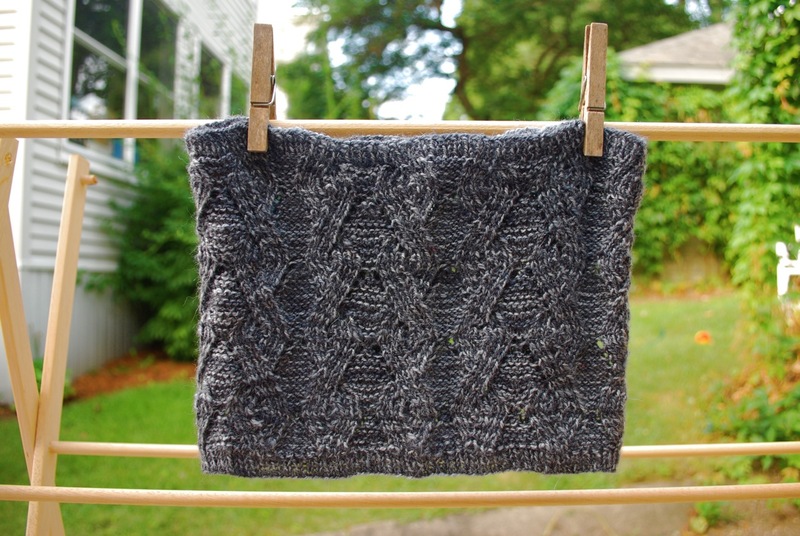 This is Anne Hanson's Curling, and it's not a completely new project for me. I had started Curling months ago with a different yarn. 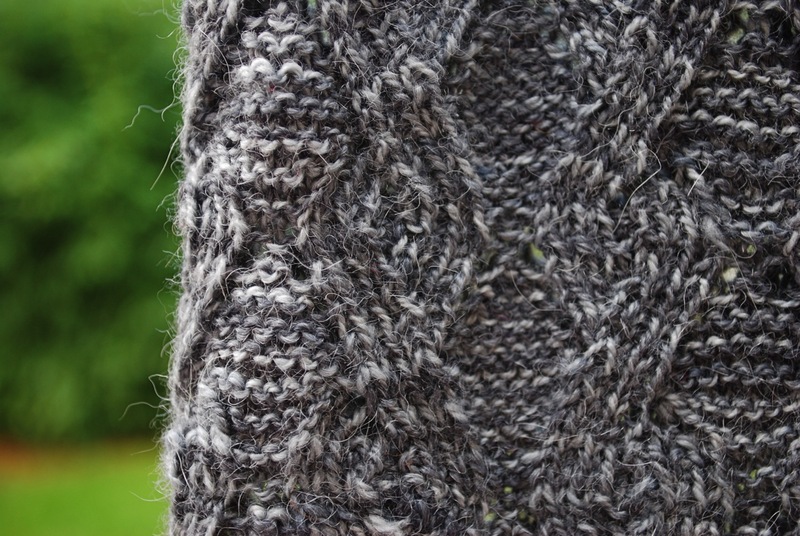 Sometimes the pattern and yarn aren't always a good fit. 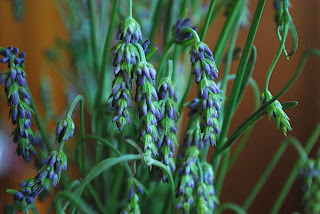 The result was OK, but I wasn't smitten with it. That would explain why it's languishing somewhere in a basket of UFOs. 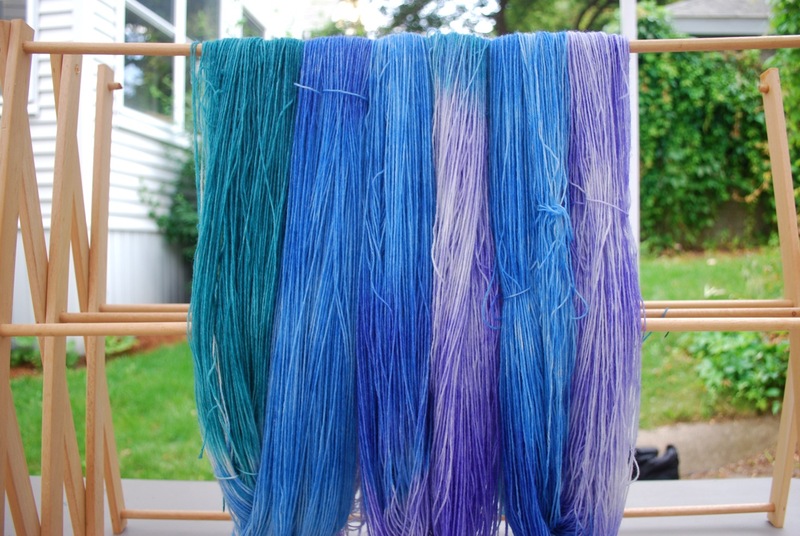 I decided to have a second go at Curling with a different yarn. I'm thrilled with the results. This one won't land in the UFO basket. I don't usually bake much in the summer, but I stumbled across this recipe and decided to give it a try. Skillet coffee cake. This recipe was a huge hit. 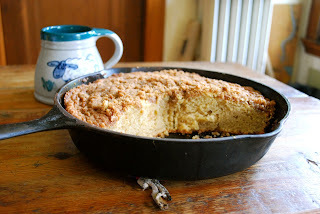 The coffee cake is loaded with butter, sour cream and sugar complete with a streusel topping. Next time I think I'm going to add chunks of apple. The summer parade of colors continues. 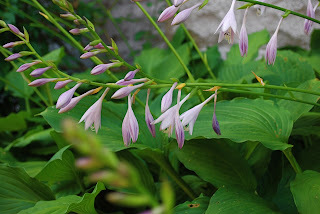 I have my neighbor to thank for this week's color inspiration. Just a hint of color. 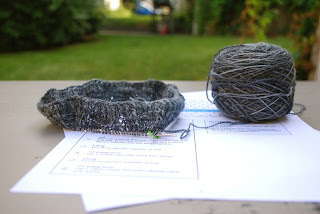 The last few weeks I've been consumed with preparations for Sock Summit. I admit it, and my family and friends will vouch for it. It reminds me of being in school - working on a huge paper with a deadline looming, abandoning everything but the essentials like eating and sleeping, finally pulling an all-nighter to get it done. The last few days have been nonstop work. I didn't pull an all-nighter, but I came close. Shipped. 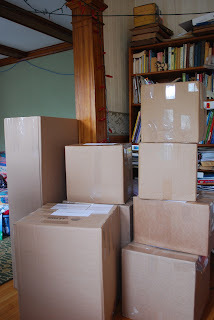 My lovely booth is packed and is making its way west to Portland. And I can breathe a sigh of relief. I still have plenty of odds and ends to take care of. I'm sure I'll be working up to the minute I get on the plane to Portland. 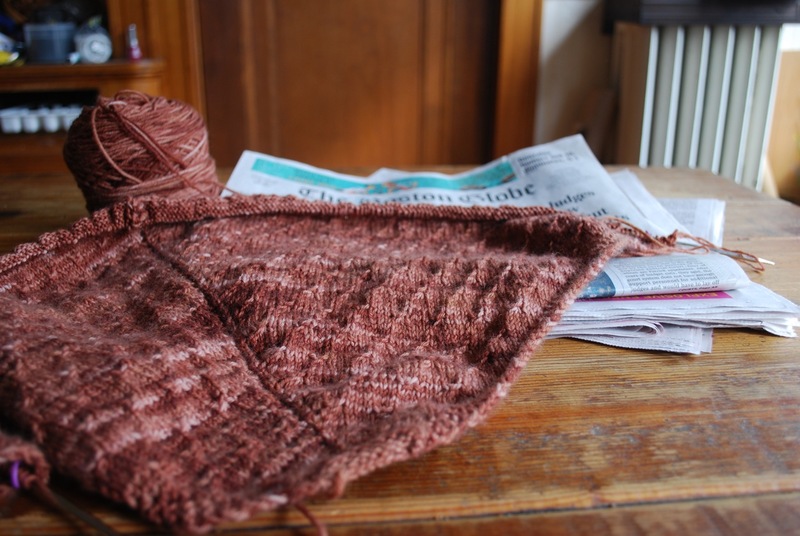 But right now I can take a minute or two for myself, my knitting and the newspaper. ~ This past Friday I heard Susan Gibbs from Juniper Moon Farm speak at the Common Cod Fiber Guild meeting. 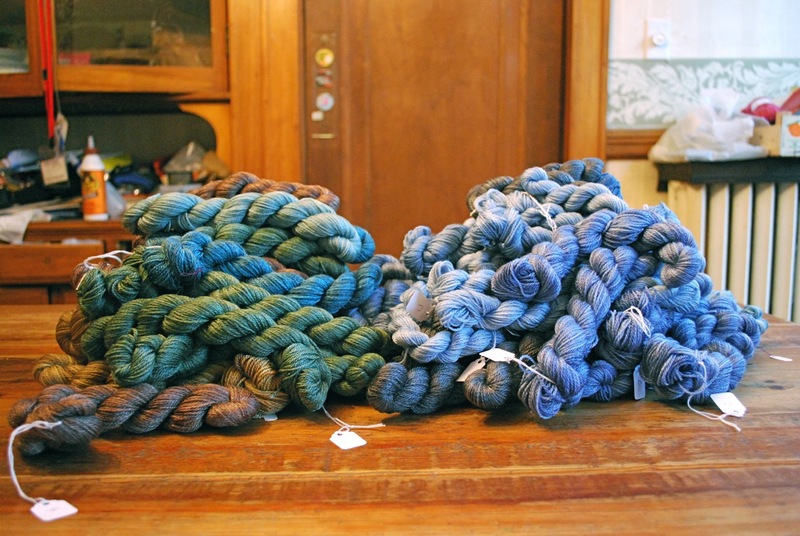 Susan raises sheep and runs a yarn and fiber CSA. 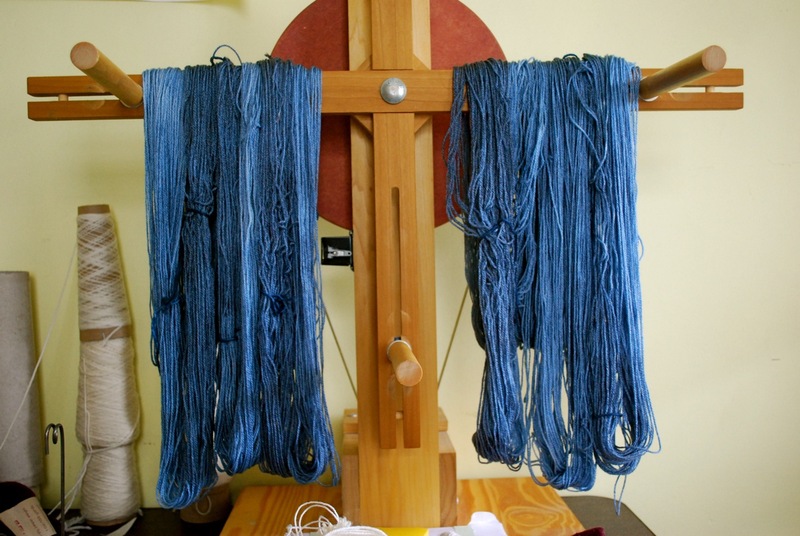 Susan has also been working to launch Juniper Moon Farm commercial yarn. 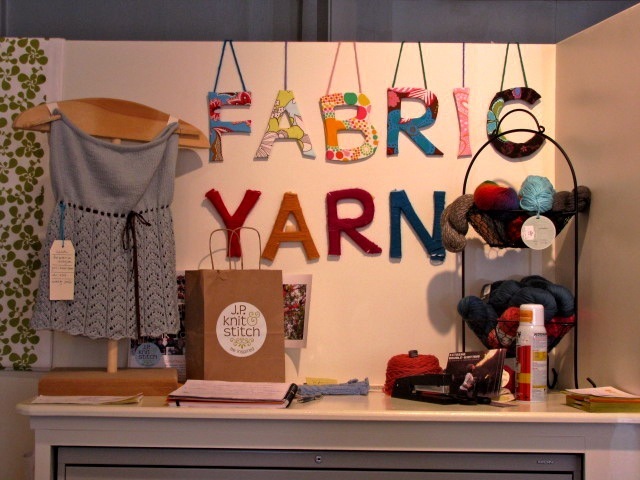 At the meeting Susan shared some of her experiences in starting this new venture - choosing yarn blends and colors, providing pattern support, running a photo shoot for the new patterns. It was an informative and entertaining meeting. 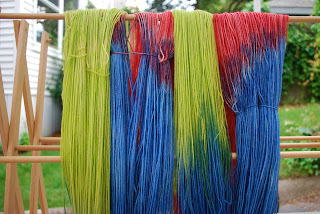 You can read more about the new yarn here. 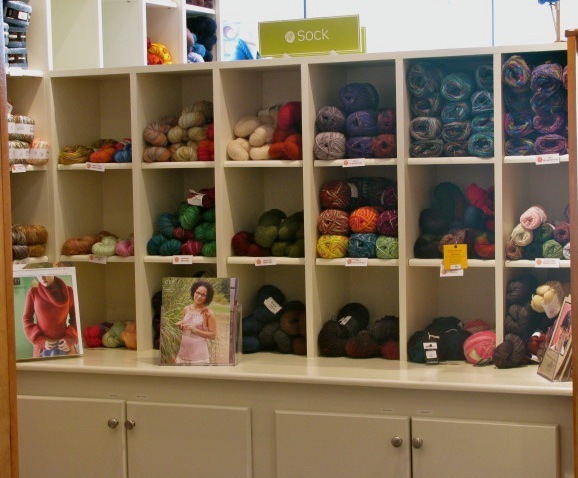 ~ Everything is coming together over at Sock Summit. One of the highlights this year will be the Fleece-to-Foot challenge. Teams made up of five people will be provided with fleece that they will card, spin, ply and knit into a pair of socks. Right now voting is underway to determine the sock pattern that will be used. Hop over to take a look at all the clever designs that have been submitted. Be sure to cast your ballot by Thursday, July 14. ~ Finally, there are plenty of celebrities who knit. 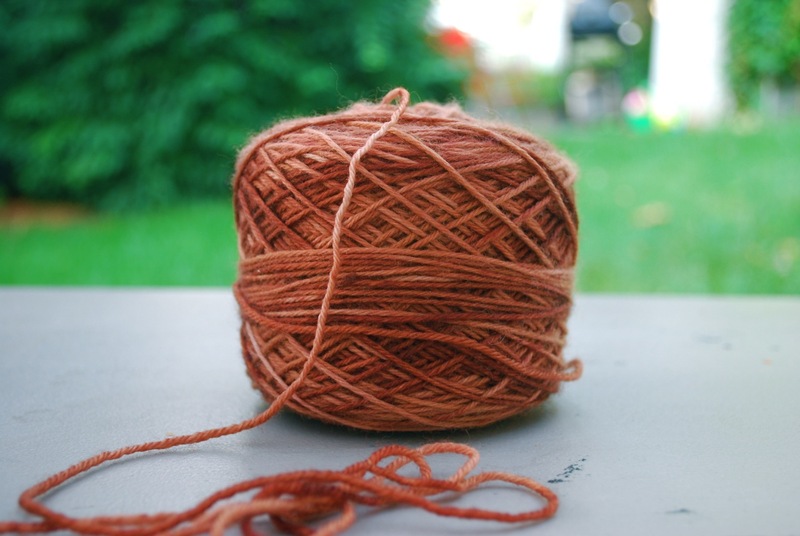 Tom Hanks played a practical joke on Julia Roberts, an avid knitter. They captured the moment on camera, and you can see it all here. 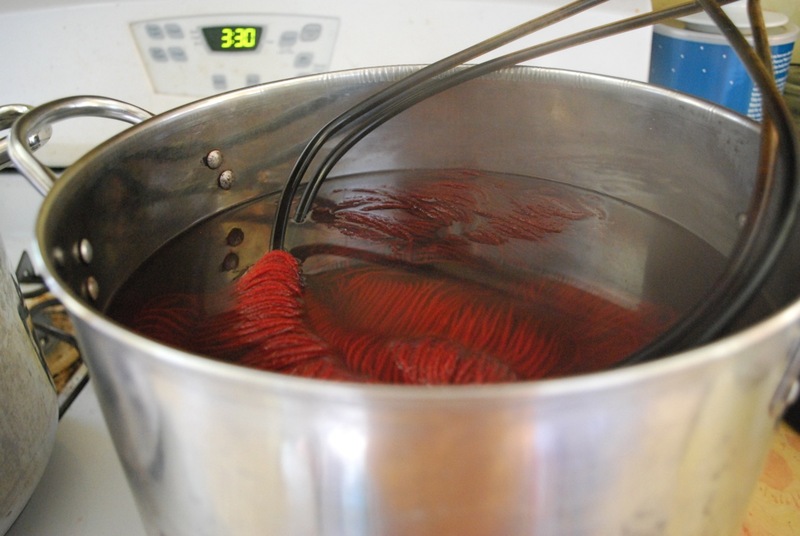 These days the most common question I hear from well-meaning family and friends is, "Are you done dyeing for Sock Summit yet?" Or a variation. 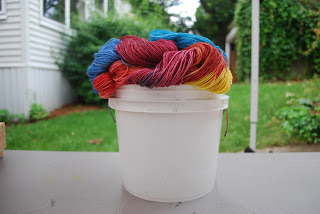 "How much dyeing do you still have to do for Sock Summit?" When I started this push to get ready for Sock Summit, I had a plan all laid out. There have been a couple of detours along the way, but for the most part I'm on course. Or I think I am. I'm afraid that if I stop to think about it, I'll be paralyzed by all that still needs to be done. It's better to keep working and not think about it too much. The dye pots have been going. Re-stocking colorways. Adding new colorways. 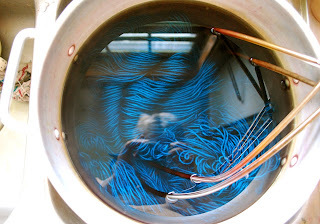 When the pots are finished, the water is clear. After the yarn is dry, the skeins are twisted. 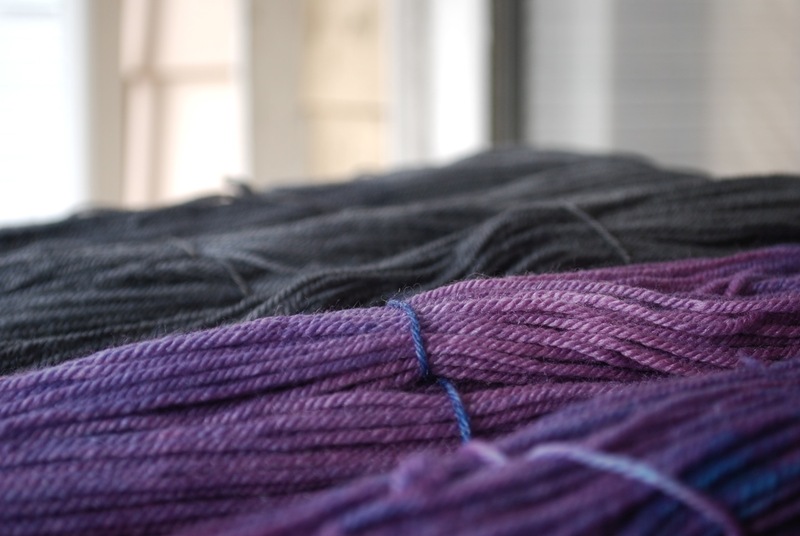 Dipped Infinity Scarf Kits in the making. There's no need to panic. As long as I keep working, it will all get done on time. Somehow it always does. My color inspiration for the week was captured on a windy day with gusts blowing in off the ocean. 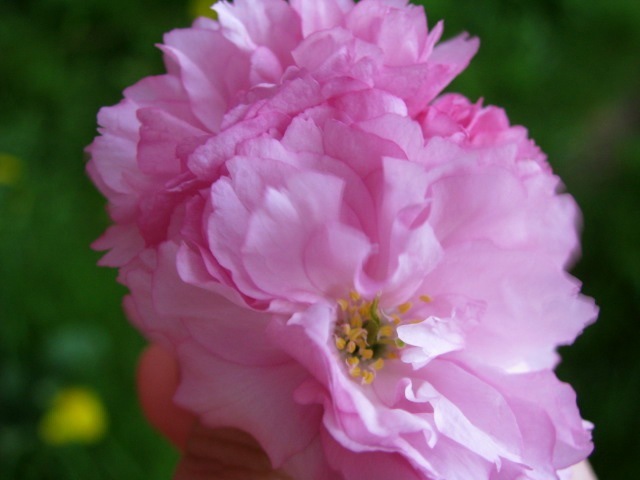 Soft pink with a bit of subtle yellow. Sometimes when life is busy, it helps to take a break from the bustle of activity. It doesn't take much. 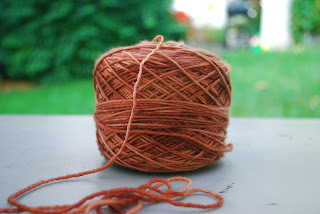 Add some knitting needles. A cup of coffee doesn't hurt either. Now this project is well on its way. Ready and waiting for the next break. We've had a long holiday weekend, and Tuesday feels like Monday. But it's not. I'm afraid I'll be out of sync the whole week. My long holiday weekend included a lot of work. The weekend also included some play. Mixing and matching colors is like eating potato chips. Once you start, it's hard to stop. I pulled out some colors I hadn't used in a while. Colors I had forgotten about. Before I knew it, I had so many ideas. I ran out of time to try them all, but I did start a list so that I can pick up where I left off. I have a feeling I'll be doing this again very soon. I have a lot of work right now - dyeing yarn, shipping to Sock Summit, sample knitting. In the midst of all this chaos yesterday seemed like a good day to take a field trip. Sometimes a change of scenery helps clear my mind. 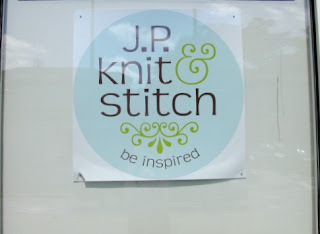 JP Knit and Stitch has been on my list of places to visit . 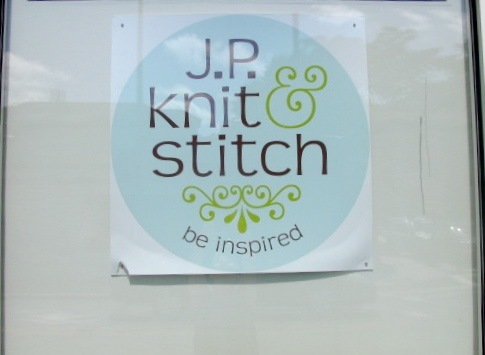 The JP stands for Jamaica Plain, a neighborhood of Boston and the neighborhood I lived in for many years. In fact I lived just a few short blocks from the store. This past winter I anxiously drove by the store when it was under construction, waiting for a chance to check it out. In the spring I would swing by but always on a day the store was closed. 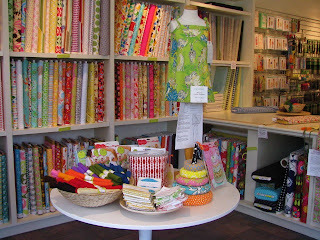 Yesterday it all came together that I was in the neighborhood on a day the store was open. There are supplies and inspiration. 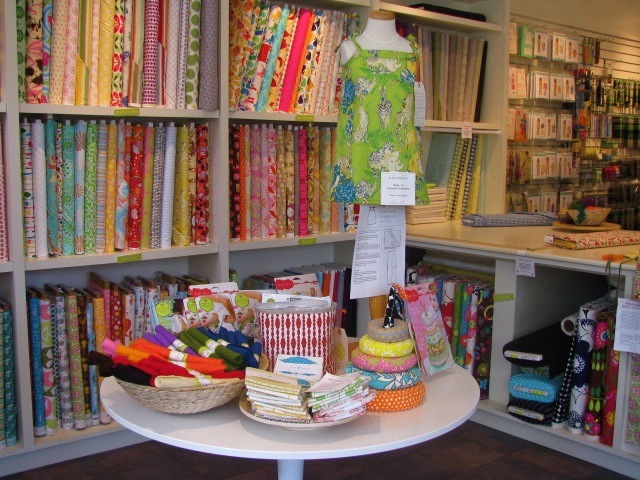 There is plenty of fabric to choose from. 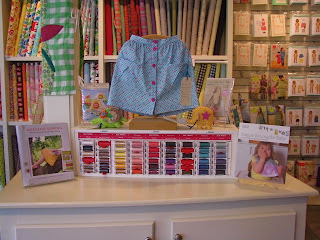 It makes me wish I had time to pull out my scissors and sewing machine. 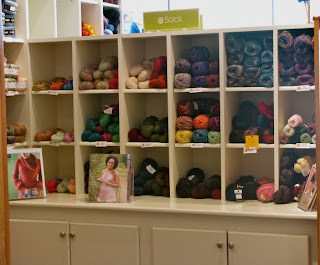 And more yarn. A cozy corner equipped to entertain little ones. 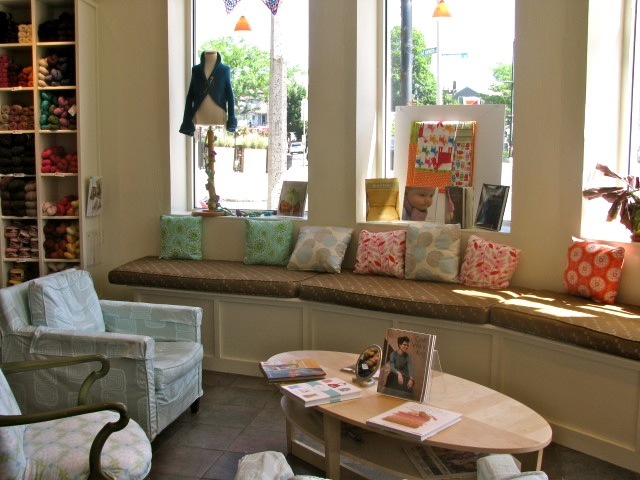 JP Knit and Stitch has good lighting and a comfy area to sit and hang out. They offer a variety of classes and have a welcoming space. This store is a great resource and an asset to the community. Best of all is this piece of work outside on the corner. 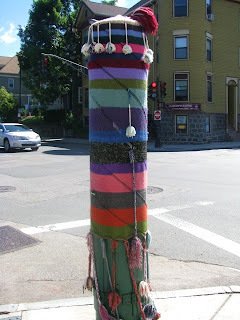 Yarn bombing complete with tassels and pom-poms. The other day this bundle found its way to my home. My sweet smelling color inspiration for the week.